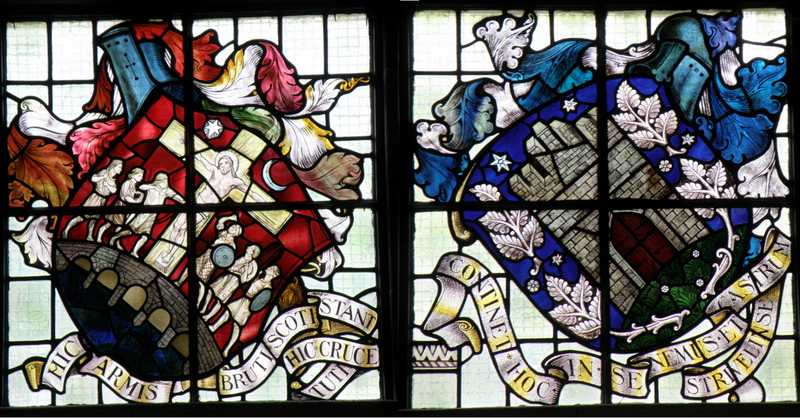 The reminder in last week’s Observer that the Municipal Buildings opened on 21 March 1919 for the first time gives a chance to reflect on the quality and substance of the building, and the story of the Stirling Coat of Arms. The prize-winning architect was John Gaff Gillespie (1870 – 1926) of the Glasgow architectural firm, Salmon, Son & Gillespie. In his time, he was responsible for buildings as varied as the Dunoon Hydropathic and the Glasgow Savings Bank in Anderston. Stirling’s Municipal Buildings was one of his last works, and in the stonework, decoration and detailing of it, he made sure that that it carried the historic, cultural and civic identity of the old Royal Burgh of Stirling. He no doubt took advice on the content from Provost Bayne, who personally funded the Burns–themed carved over-mantle in the Entrance Hall. The stained glass window in the Entrance Hall of Alexander II’s presentation of a weekly market to the burgesses in 1226 was designed by Gillespie himself and made by William Meikle and Sons of Glasgow. Shown here are the heraldic Arms of Stirling which flank it. The inscriptions note that ‘The Britons stand by force of arms/ The Scots are by this cross preserved from harm/The castle and bridge of Stirling town /are in the compass of this seal set down’.